2012 Robert Tonner A Am Lorelei Lee outfit for 16 inch Marilyn Monroe dolls, No. T12MMOF04 fits the Starlet body of the Marilyn Monroe doll. This outfit is from the movie, 'Gentlemen Prefer Blondes.' This body has the same bust and high heel feet as the Tyler Wentworth body, but the hips are slightly wider. 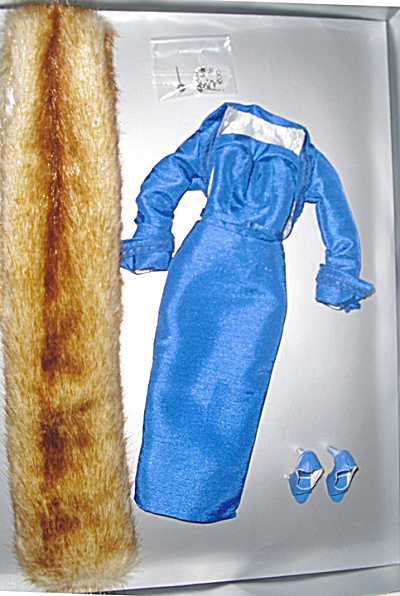 The 'I Am Lorelei' outfit contains a rich royal blue dress with lining, a blue matching belt, a blue jacket with matching lace trim, matching open toe blue high heels, an imitation fur boa, blue rhinestone earrings, and a rhinestone bracelet. The price is for the outfit only and not the catalog doll modeling the outfit. New and mint-in-the-box. This outfit is from limited edition of 300. Expand listing to view all 4 photographs.